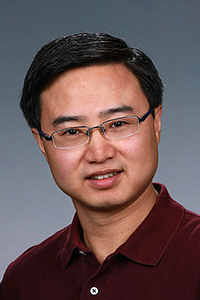 Congratulations to Dr. Hailong Wang, atmospheric scientist at Pacific Northwest National Laboratory, who was appointed to the editorial board of Atmospheric Chemistry and Physics (ACP) in May 2015. As an editor, Wang will use his expertise in atmospheric aerosols, cloud physics and dynamics,aerosol-cloud-precipitation interactions and climate change to handle the review of manuscripts submitted to the journal. ACP publishes studies on the Earth's atmosphere and underlying chemical and physical processes. The journal covers topics on atmospheric modeling, field measurements, remote sensing, and laboratory studies of gases, aerosols, clouds and precipitation, radiation, dynamics, biosphere interactions, and hydrosphere interactions. ACP is published by the European Geosciences Union. Wang was chosen by the journal for his wide-ranging knowledge of atmospheric and climate modeling and extensive experience in studying aerosols and their effects on clouds, precipitation, radiation and climate. He is an active member of the American Meteorological Society Cloud Physics Committee and the DOE Atmospheric Radiation Measurement Program User Executive Committee. Wang received his Ph.D. in Atmospheric Sciences from the University of Illinois at Urbana-Champaign in 2007 and joined PNNL in 2009. He has published nearly 40 peer-reviewed journal papers, some of which were highlighted by national and international news media such as Discovery News, National Geographic News, Nature Research Highlights, and Science Daily.